A common scenario during mobile testing is to attach a screenshot while logging any defect. Most of the times, this involves copying mobile screenshots to your computer using data cable and then uploading it to your bug tracker. Pretty boring job if you ask us. Wouldn’t it be convenient enough to upload screenshot in your bug report directly from mobile device? The Android app we have covered in this post lets you do just that. This app called Jira Shot is developed by Mike Roelens and can be downloaded from Google Play Store for free. When you open the app after installing, it shows all the screenshots you have taken till date. You can then select one of them and upload it to your JIRA ticket. All you need to do is to give your JIRA URL, defect ID and JIRA credentials. Additionally this app provides basic image editing capabilities. It allows testers to edit and annotate mobile screenshots to demonstrate bugs. A huge time saver, we must say. The only feature we found lacking in this app is an ability to rename screenshots. As many of us prefer comprehensive screenshot naming, this feature would have been one hell of an addition to this already awesome app. However it’s just a quirk, not a deal breaker. 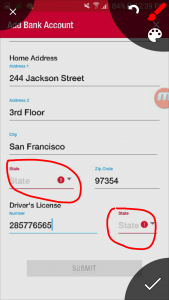 Below is the screenshot of this app in action. You should be able to use this app in Android 4.1 and higher versions. All in all, it’s a great little app immensely useful in boosting mobile tester’s productivity. We would love to see such similar app for other platforms as well. Are you using any tools to manage your mobile screenshots while testing? Share with us your learning in comments section. We would love to hear from you. Cheers and happy mobile testing!